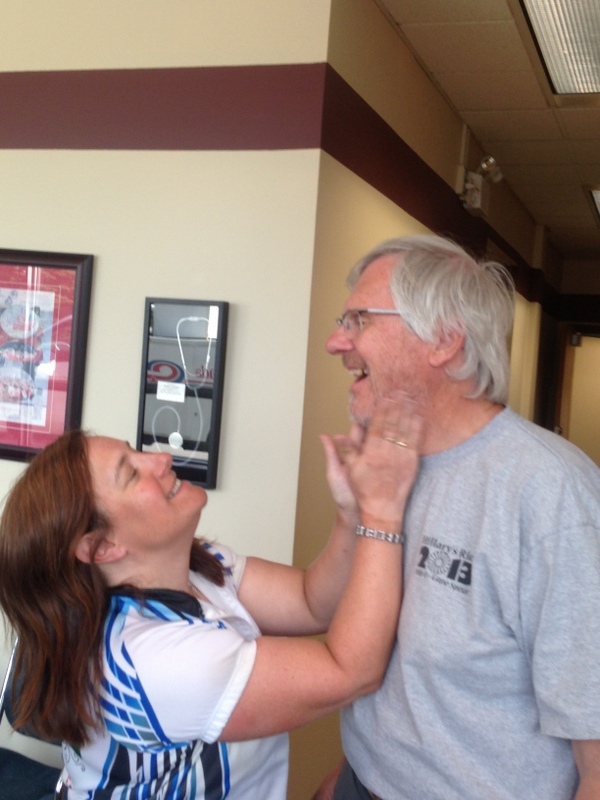 Bob and Brian left us this morning, so it was hugs all around. I’m sure Bob was the most reluctant to see us go, as we had been carrying a lot of his gear for him the last few weeks, so he would now be travelling with a full load again. But he would be meeting up with his son in Ottawa in about a week, so that was spurring him on I’m sure. I think I’ll be going through Brob withdrawl for a few days. The rest of the day did not go at all as planned. I was up late last night, almost to midnight, trying to get my blog posted, but was having numerous technical difficulties. So I decided to work on it in the morning until I could get it posted, as it was long overdue because of bad internet connections and really long cycle days. Just as I finished, and Al and I were getting ready to go, we got a call from Terry. He had gotten his chain jammed between the big back gear and his spokes. Although he got it out with 2 screwdrivers courtesy of the resident whose driveway he was stopped on, it bent his derailleur. 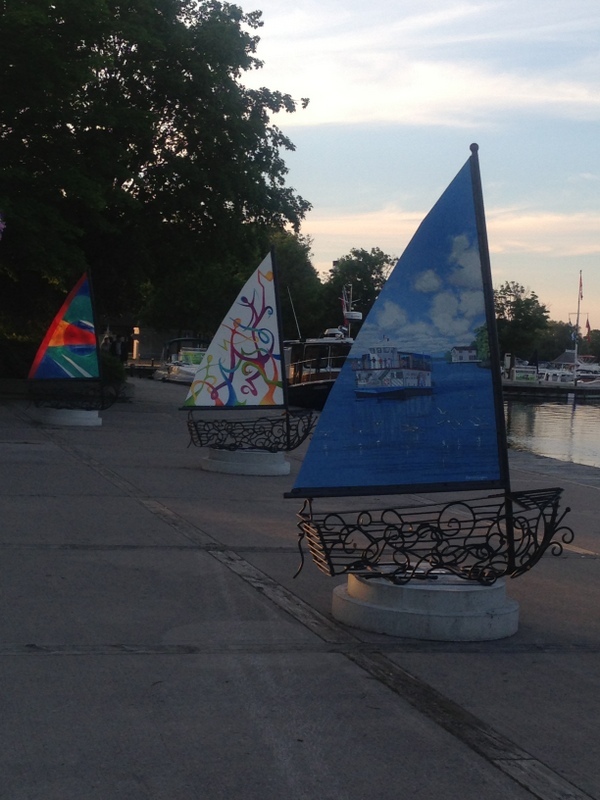 We picked him up and then shuttled to Meaford, where Bill was as he kept cycling forward. After a few phone calls, and trying to find the new bike shop that was maybe supposed to be open in Meaford (which we never did find), Al and Terry went back to Owen Sound, and Bill and I carried onward, stocked up with plenty of food and water. 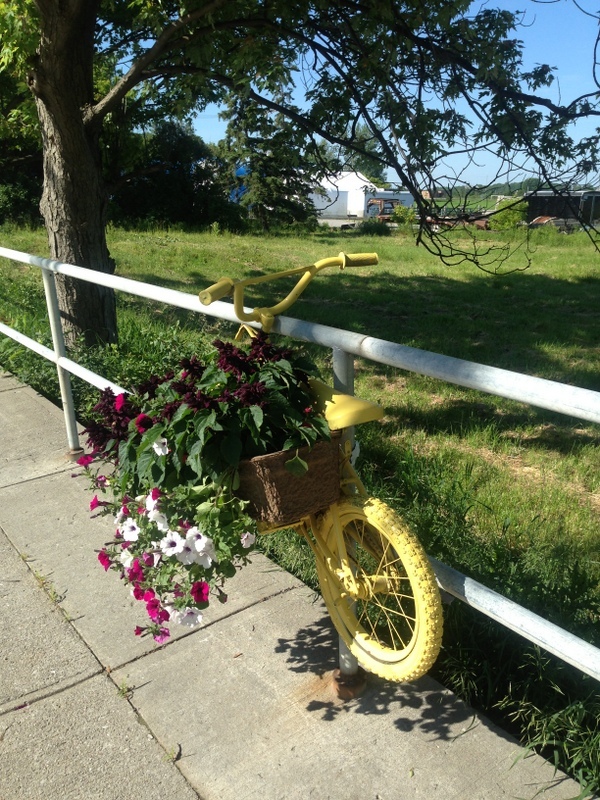 They took his bike to Jolley’s, in Owen Sound. Thanks to Shane for squeezing Terry’s bike in, and fixing his derailleur lickety-split. 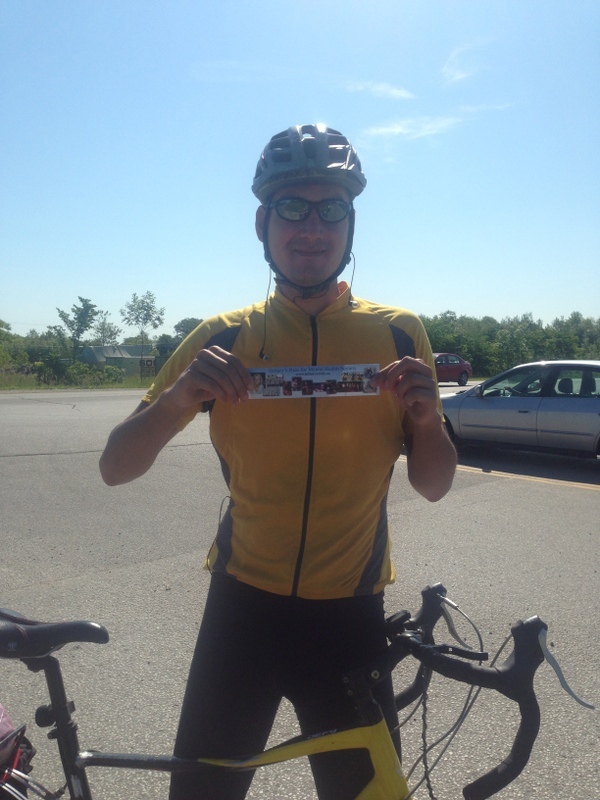 Bill and I met up with a young cyclist, Iohan, who is planning to cycle across Canada in August. He was asking us all kinds of questions which were really well thought out and pertinent, so you could tell he was serious and knew what he was getting into. He was uber-fit and planning to do long distances each day– if anyone could do it, he could. He had had a crash just weeks earlier, where he broke his collarbone, and he was already out on his bike again. Iohan, we wish you lots of luck, and have fun! We stopped to have lunch in Collingwood, the best mac and cheese I’ve had in a long time, and tried not get too far ahead of the RV. Terry and Al caught up with us in no time, and we were all on the road again. We ran into some really bad roads with narrow, broken up shoulders, it was getting prepped for resurfacing, so I guess we were one summer too early. We were greeted by Tom Carney, a friend of Cheryl Ann’s, out on the highway. I saw Bill pull over and shake his hand, but I was a bit confused and not sure who he was. He said something to me as I cycled past, but I didn’t quite catch what he was saying, so I missed talking to him personally, which is a shame. Thanks for stopping to welcome us Tom – what a neat surprise! 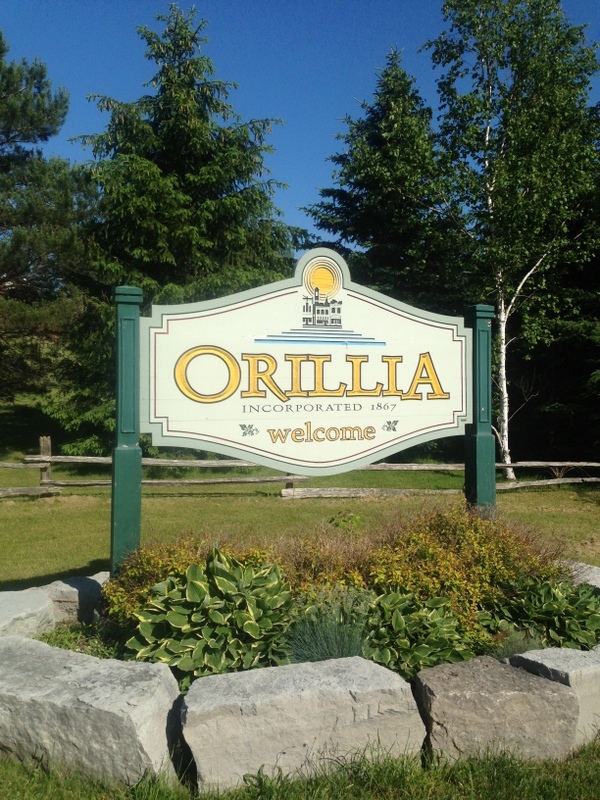 The next glitch we ran into was finding a quieter road to cycle into Orillia. Did you know that google maps are not the same between iPhones and Microsoft? Bill and I were getting different information, listing different roads and directions for the same route. We finally took our chances and went to see which route was correct – iphone won. It took us on a hilly residential street, and then a back road, the Old Barrie Hwy. It was again very beautiful and peaceful, so much better than the main highways. On that road, both Terry and I fell over in the gravel taking pictures of each other. This coincidentally happened at the exact same time, so neither of us saw the other fall, and we were so busy checking to make sure no one saw our “klutz attack” that we didn’t realize the other had fallen too. That is, until we discussed it at the end of the day, and had a good laugh. Tonight we got a very special treat in Orillia. 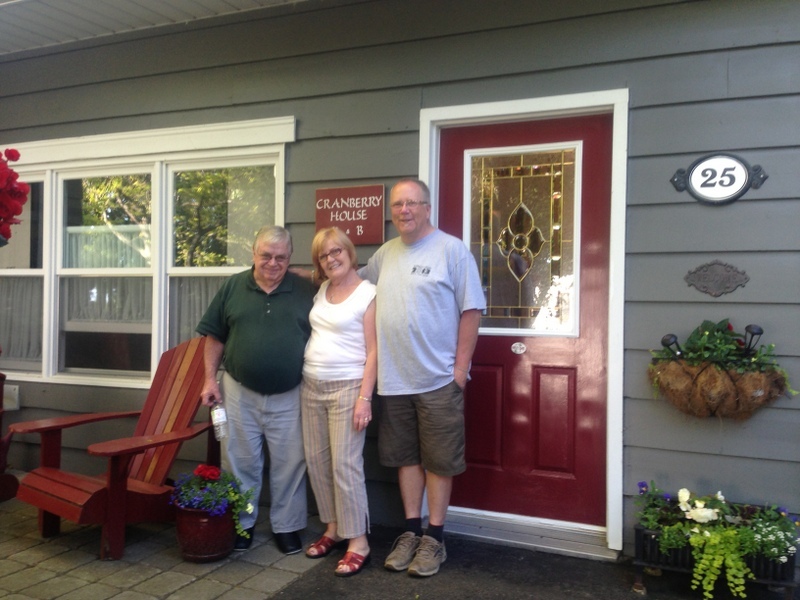 Anne and Charlie Cole own and operate Cranberry B&B, fabulous lodging that Bill and Betty jo discovered when they attended the Mariposa Folk Festival years ago. They graciously provided accommodations for the night, and I was especially thrilled, as I got my own bathroom and bedroom, and even had my first bath, a bubble bath no less, in months! What a treat! They treated us royally. They made excellent dinner recommendations to Brewery Bay pub, then we walked down to the marina for a look around, and then Charlie came and picked us up so we wouldn’t have to walk back. Amazing hospitality, we were spoiled rotten! They even had wine and cookies waiting for us when we got home, but that bathtub was calling my name……. Anne and Charlie were up at the crack of dawn to make us a hearty and wonderfully presented breakfast at 6:45 am. It was really hard for me to get out of the comfy bed, knowing I would not be getting back into it tonight. We started out on Hwy 12, which Charlie warned us would be busy with gravel trucks and other work vehicles, and he was sooooo right. We had no shoulder again, and we were anxious to stay safe as they weren’t moving over very much, so we decided to take a detour. 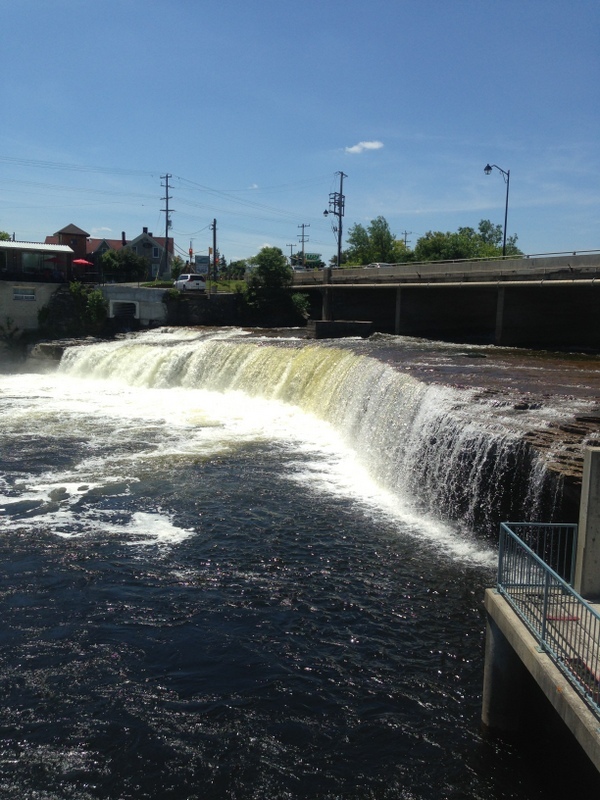 We ended up on County Road 8 – a more northern route – and went through Fenelon Falls, where we stopped for lunch. Al’s beard is so soft! We had to take Al to the bus station for 6:00 pm, to catch a bus to Toronto, as he is leaving us for 5 days to attend a family wedding back in Edmonton. Even though it’s just a few days til he’s back, we will sure miss him! I had to get a picture of his beard and “mop top” before he went, because I’m sure it will be long gone before he gets back. We went for dinner at our trip favourite, Boston Pizza, who never fail to give us a discount in support of the ride. 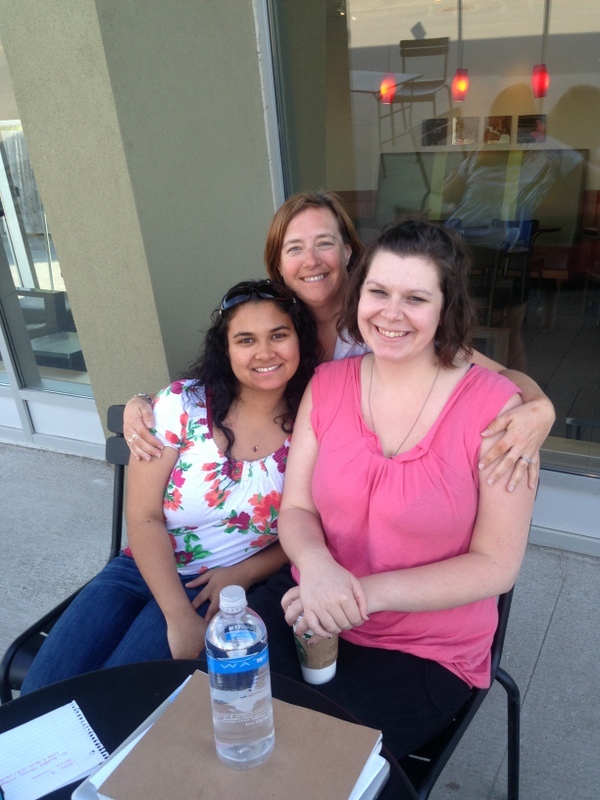 When we arrived In the parking lot, two gals, Jenna and Mary, ran over and asked us to sit with them for a while at a local coffee shop. They had googled the website on the van, and had just had a lecture today at school about suicide and mental health, as they are both taking Child and Youth Care at Sir Sandford Fleming College in Peterborough. We had a great discussion about the importance of bringing awareness to these issues, and they had also had personal experiences with mental health challenges. We gave them a stack of bookmarks for their classmates and instructors. If they are representative of future youth workers, we’ll be in good hands. After dinner, we checked out the locks in Peterborough, as they are a unique type that work on special hydraulics, one of only two of this type in Canada. 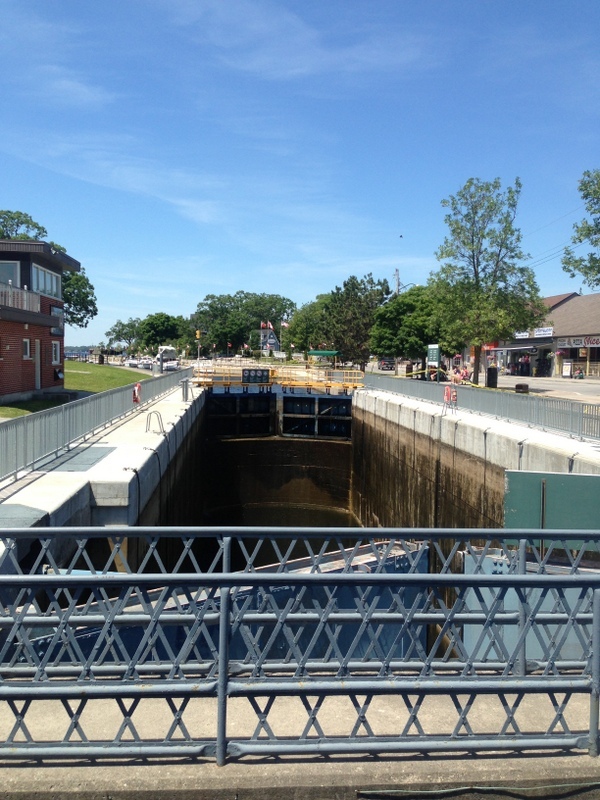 We have seen all types of locks in many of the towns that we have passed through the last few days. Don’t see too many of those in Alberta, that’s for sure! We got back to the RV site late, just enough time for a shower, and then off to bed. It’s almost the solstice, so we were in bed before the sun. Learning our lesson the days before, we took a country road first thing. It started out very hilly, I was worried it would continue, which would make for a hard, tiring day. Very shortly, we met John walking into Peterborough, as he is training to walk the Camino in Spain. If you have never heard of this “personal pilgrimage”, I suggest you look it up. After a good chat, he assured us that the steep hills were behind us. I’ll take hills and bumpy roads over no shoulders and near death traffic experiences any day. This road was so beautiful, full of farms and acreages, and just lush. I had David Francey’s song about Peterborough County in my head all morning, and it was getting me primed for his concert coming tomorrow. We got to Hwy 7, the Trans Canada again, after about 32 km. We then had construction for 15 km – 13 km of it was prepped for resurfacing – which means it’s like a washboard and if there is anything loose on your bike, it will be gone in no time. The other 2 km was one lane traffic. We’re finding as we get to more populated areas, the pace of life is picking up considerably, and it is most evident in the speed that the traffic moves. When your life consists of getting up and biking to your next location, you forget what a hurry everyone else is in, and the risks they are willing to take to save a few minutes. I wish I could say I won’t get sucked into that when I get home, but I know from experience that I’m easily pulled back to the dark side. 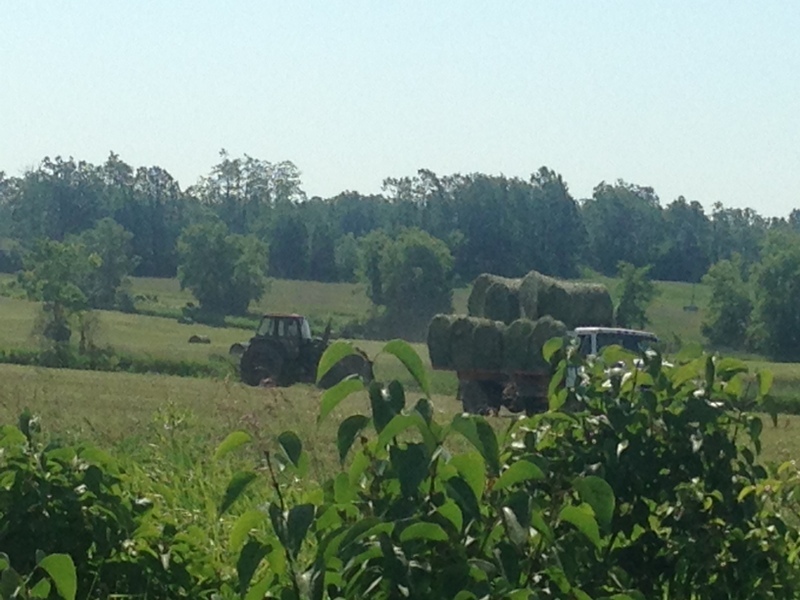 We got to our RV site west of Madoc, which we almost all missed because we thought it was east of Madoc. It was our shortest stay ever, because after emptying the black water tank, and having showers, we were shuttling to Deseronto for the concert. Doug Law, the MC for the evening and long time friend of Bill’s, invited us to park the RV at his place. So we packed up again and headed down the road, after ensuring Stephanie at the Quality RV Campground that we appreciated her hospitality too! And speaking of RVs, we just got wonderful news from our friends at Fraser Way RV, who rented us “the Mothership” as we lovingly call it. They have generously allowed us to keep it at no extra cost until North Sydney, where we catch the ferry to Newfoundland, thus avoiding trying to find another support vehicle for the last few days in Nova Scotia. Mike Bowlen, Bill’s brother-in-law, has graciously agreed to accompany us from Halifax to the ferry, and drive the RV back to Halifax. Three cheers for all the businesses and wonderful people who continue to give us their full support! 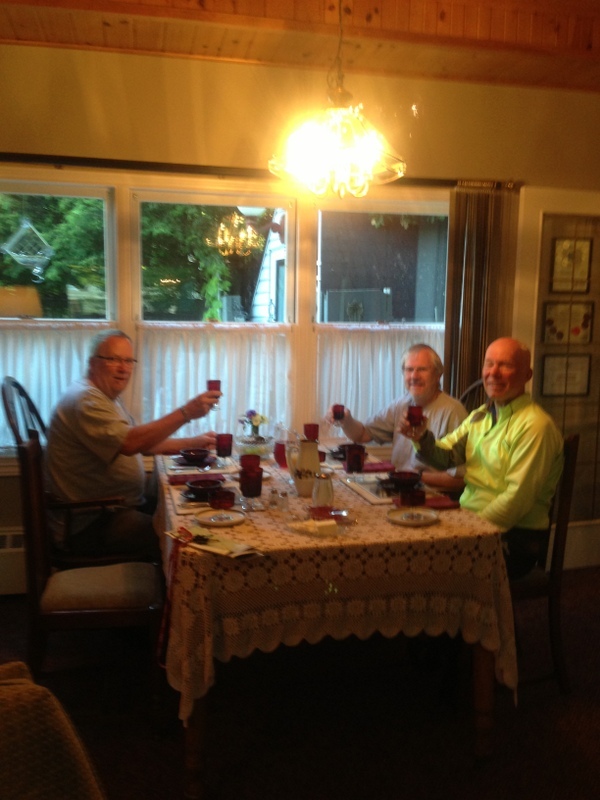 We arrived in Deseronto to a warm welcome from Doug. He showed us the venue for tonight – wait til you see the pictures – and then brought us to his home. He’s had a trying day, as his son is at the hospital with a high fever, and had a plumbing mishap this morning, but he was still smiling from ear to ear. We’ll be pretty busy the next few days, as we have 3 concerts in 4 days. They make for long days, but they are also energizing, as we are enveloped in so much support and love from like-minded people. And of course there is the soulful music offered by all the wonderful artists. This is the whole reason we are here. 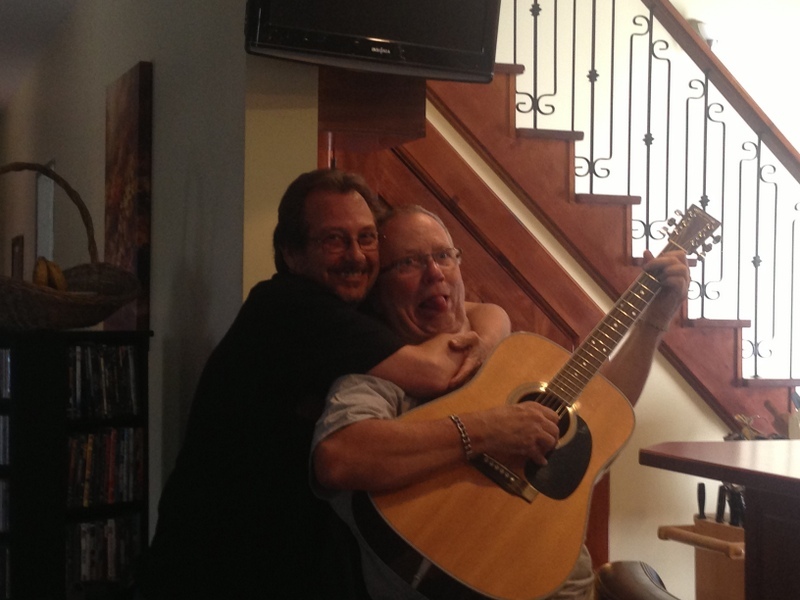 In fact, as I write this, Doug and Bill are treating me to a private rehearsal/concert. How honoured I am to be a part of this – worth every aching muscle and steep hill, I assure you. I’ll report on the concerts as soon as I can in my next post. Thanks for the great update on your adventures on 2 wheels! You have a lot of KM’s behind you and hard to believe you have travelled so far already!!! HAPPY SUMMER!!! I hope you have the wind at your back and that God keeps you safe!!! Hugs from home! Great to hear your interesting stories and progress on your quest. You guys have all done such a wonderful job. Keep up the good work and be safe. Our prayers are with all of you.